To complement the program components included in the GRIP in Argentina experience, you can choose any or all of the program add-ons here to allow for additional professional and cultural immersion. If you’d like to extend your stay beyond the eight weeks covered by your GRIP grant, you can also select extra housing weeks below. Enhance your professional skills through these two one-on-one mentoring sessions with Puentes staff. Resume Session: One hour in-person resume review session, through a one-on-one meeting with Puentes staff. We do a detailed critique of your resume in advance of the meeting, and then together in person, we share our personalized recommendations with you and review resume best practices. After the in-person meeting, you can share with us your updated resume, and we will do another edit. Puentes Resume Guide included. Interviewing Session: One and a half hour in-person interviewing skills session, through a one-on-one meeting with Puentes staff. We do an actual mock interview with you as the interviewee and us as the potential employer of the target company or organization chosen by you. Immediately following the mock interview, we provide you with detailed, personalized feedback on your interviewing style and response content, and we share best practice tips, plus the Puentes Interviewing Guide. You will venture to an “estancia” (ranch) in the Pampas region outside of Buenos Aires for a fabulous day of adventure and culture. 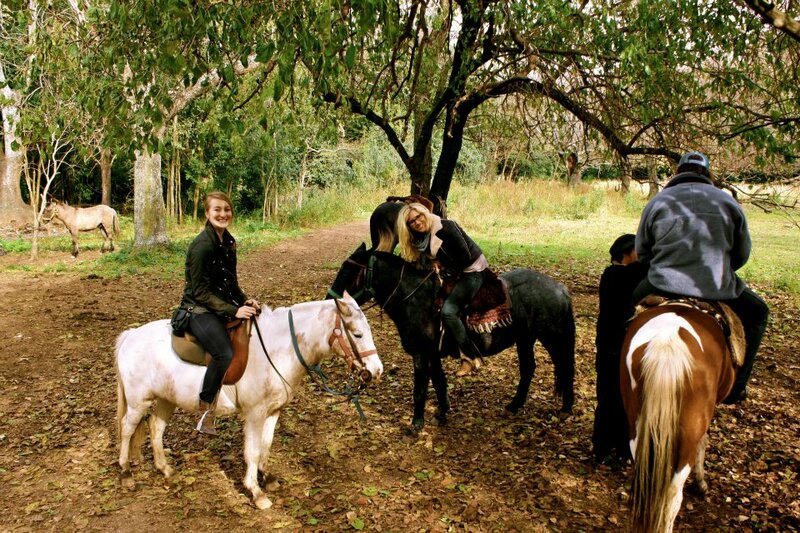 Once you arrive to the estancia, you will have empanadas and get the chance to ride horses. Then you’ll have a big “asado” lunch, followed by a horse demonstration and traditional folklore music and dance show by the “gauchos” (Argentine cowboys). In the afternoon you will have more time to explore the estancia, and then enjoy a “merienda” (tea time) before departing to return to Buenos Aires City. Put on your dancing shoes and get ready to experience one of Argentina’s most famous exports: tango! By participating in the Puentes Community Impact Day, you will make a positive contribution to Argentine society, while more fully understanding the country’s socioeconomic context. You will work together with under-resourced families to help them build their own houses using reused, recycled, and sustainable materials, through adobe construction and “ecoladrillos.” You will get hands-on learning about sustainability, construction, and community building while literally getting your hands a bit muddy in the process. Puentes offers Spanish Jumpstart in order to refresh and strengthen your language skills before diving into your experience. The language classes are taught strictly in Spanish in small groups so that you are fully immersed in the language for three to four hours per day, five days a week during your language training. Many Puentes participants choose to do one to two weeks of Spanish Jumpstart classes before starting their internships. This allows a dedicated time for language and cultural adaptation (and for exploration of the amazing Buenos Aires sites), which can be very helpful to have under your belt prior to your internship. You can select multiple Spanish Jumpstart Weekly Programs if you would like more than one week of language immersion. We will arrange your housing so that you will be settled into comfortable, pre-screened, and well-located accommodations during your time in Buenos Aires. All Puentes housing includes bedding, towels, weekly cleaning, and Wi-Fi access. To help you select the best housing option for you, please review our Housing Guide. When selecting your housing option, please enter the correct number of weeks for which you’d like Puentes housing.